Itsuka Kotori is best described as two sides of a coin. One side is colored white; the other, black. White represents pureness, innocence, and playfulness. 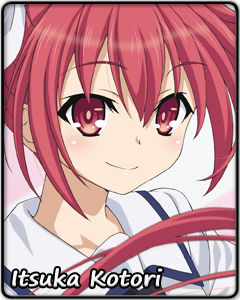 When Kotori dons a white ribbon, she acts as your ordinary cheerful and energetic middle school student. This Kotori is rarely embarrassed about expressing her affection for her brother, and she will always be there to wake him up first thing in the morning to go to school with him. White also represents weakness, dependency, and childishness. The white Kotori acts on her emotions and refuses to base her judgements on cold reason. She just wants her brother to be happy. Black represents strength, leadership, and integrity. When Kotori dons the black ribbon, she is the one people rely on, she is the one people listen to, and she is the one everyone highly respects. She becomes calculating, able to calmly analyze the situation before her and make the choices that promise the best results. Black also represents a ruthless brand of pragmatism. This Kotori can only see what is in front of her and will use her status and power to have things done her way, no questions asked. Even if what she ultimately wants is for everyone to be happy. No matter which side of her you look at, there are some things that will never change. She will always have a fondness for sweets, start the day off with a high note, and wish to the doted on by her brother every once in a while. Because ribbons notwithstanding, she is, was, and always will be herself – Itsuka Kotori.